You play a female protagonist who has discovered that she is much different than everyone else. 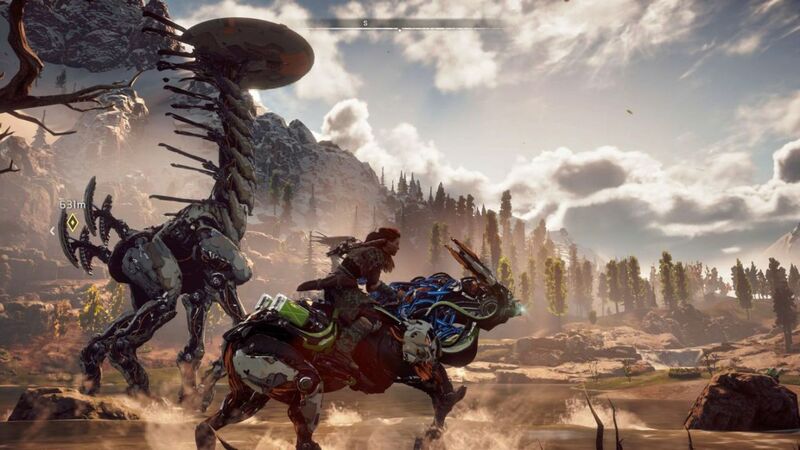 Driven by purpose (and a small technologically “advanced” device), Aloy must find out what is going on in this savage world. Hints at technological advancement are abundant with wild machine-like animals wandering the vast land. These machines are mixed alongside normal animals such as boars, rabbits, foxes, fish and many other types. As Aloy moved from town to town, cavern to cavern and mountain to mountain, she discovers more and more about her past and even more about herself. You start the game off as a child. Practicing your hunting skills with your guardian Rost. Rost teaches you how to hunt the machine-like animals and also how to be resourceful and collect materials that you can craft into many things such as potions, arrows, bombs, etc. Wait, Wait Wait… this sounds much like a Far Cry Primal type game now doesn’t it? Well, it actually takes a lot from the Far Cry series but fortunately it takes all the bad parts and fixes them to give you a better experience. Where Far Cry Primal went wrong was the connection between story and gameplay. There was no real engaging part to it. You just mundanely went from one task to the next. Horizon: Zero Dawn attaches the story in such an elegant and exciting way that you don’t mind collecting everything along the way. Horizon: Zero Dawn is beautiful. Just beautiful. If you have a PS4 pro you will definitely notice the difference. The lighting, animations, particle effects, weather, sounds, transitions, environment, and almost everything in this game is a stop and stare moment. I caught myself gawking quite a few times from the top of a mountain at the landscape below. I was even amazed at the level of graphical intensity in the cut-scenes. For a moment I thought that they were pre-rendered. Nope. All in-game. The machine-like animals (which are all enemies unless you override them to be your ally) move with such power and dominance. They know they own the area and they walk like nothing will ever stop them. Think of Shadow of the Colossus with the giant bosses. Sometimes you just get caught looking up at a beast and you can’t help but weep because you know in a second you are about to be man-handled in one swooping motion. 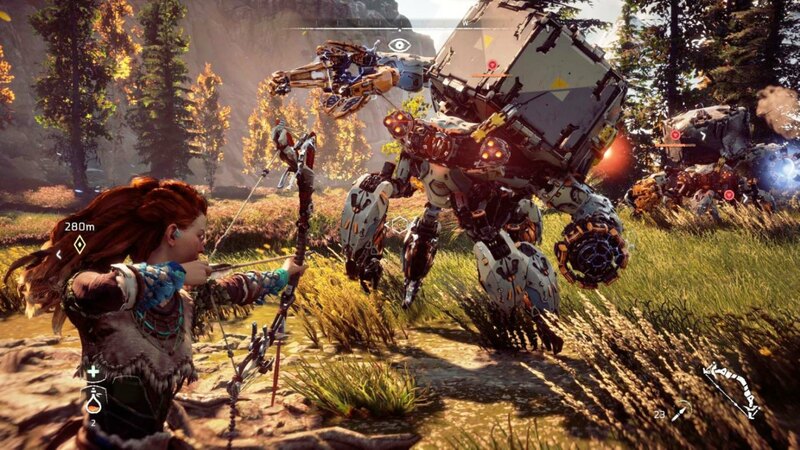 The amazing part of these machines and the combat system is that you not only have to hit them, but you also want to hit them in their weak points (which can be seen using Aloy’s handy little device she discovers). These weak points can be broken off of enemies to make them weaker. Some enemies have heavy weapons such as turrets, lasers, or rockets. If you knock off the weak points with special types of arrows, you can pick up the parts (unless you die). These parts can be used to upgrade your bow. Yes… your wooden bow and arrow can be upgraded using advanced machine parts. Moving on. Crafting is a big part of the game. You pick up so many resources early on that you get confused at what is useful and what is not. Luckily for the game, it tells you whether or not something is useful for crafting, trading or just selling. This helps you sort through the junk. Like most games, you craft many things like potions, bombs, arrows, traps, and bigger carrying capacities for everything. You purchase different weapons from merchants (better bows, different bows, interesting bows… ok well, just a bunch of different things that should different types of arrows). These weapons can help you set traps, anchor down enemies, put certain effects on enemies (ice, fire, shock). Depending on what you want to do, this game will generally let you do it. A flying enemy getting away from you? Chain it to the ground so you can lay waste to it at close range. An enemy too fast for you? Slow it down with some ice bombs or arrows and pick it apart limb by limb (or machine part by machine part to be more accurate). Main Story Good! Side Stories Not So Good! One thing I will say is that the main story was amazing. I was saddened that the side stories were mere afterthoughts. At least that is how it felt. I found myself skipping through a majority of the side quest dialogue just so I could go do it and get it over with so I could get the experience and upgrade my skills (which by the way is a simple to use skill tree that just enhances how you go about taking down enemies and makes you stronger in different ways). If anything you will want to play this game for how fascinating the main story is. It starts off a bit slow but ramps up pretty quickly. 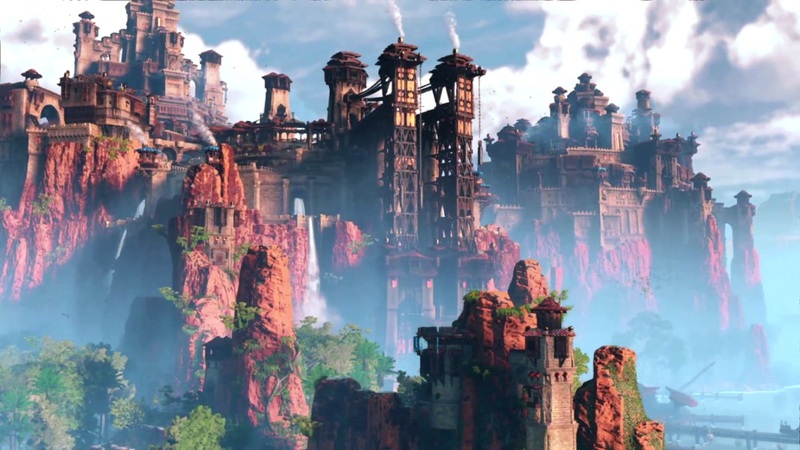 Aloy finds herself in a mess and discovering how she is a part of it all was eye-opening. 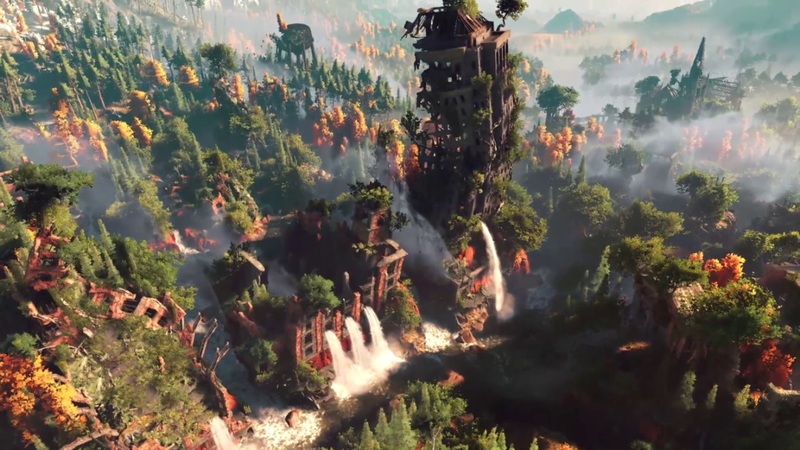 There are a lot of places in the world of Horizon: Zero Dawn that you will not explore during the progression of the story. Luckily, for all those collectable-happy go-getters, there are lots and lots of collectables to discover. Metal flowers, figurines, vessels, and even glimpses into the past from visual lookouts. There is so much to go back and do in this game when you are done. It truly is an easy platinum trophy for those that are looking to do those type of things. You don’t even need to finish the game on the very hard difficulty to achieve it. Playing on easy can get you everything. There is also one piece of armor that you will definitely want to discover during your play-through. Let’s just say: advanced tech always beats out cloth and string right? The map isn’t as big as games like GTA V or some of the Just Cause maps but it still fits well for what it needs to present. Sometimes you don’t need an overflowing landscape to get your point across. Everything is here for a reason. This game has a lot going for it. Want some stealth? BAM. Want some RPG elements? BAM. Want some adventure? BAM. Want some action? BAM. Want some… okay you get the point. It has a lot. This game is worth the play-through. It is beautiful, fun, engaging, and delivers a great story.